The Pilgrimage to Our Lady of Stone takes place on May 21. The Procession begins at 2.00 p.m.
Vigil Mass for Sunday at 4.00 p.m.
Sr. Angela Mary Leydon O.P. From the International Dominican Information comes an interesting report about the Lay Fraternities. Br David Kammler OP, the General Promoter of the Laity visited Fraternities in the Province of Teutonia (Germany) and France. He first visited the fraternities in the cities of Cologne and Düsseldorf, which belong to the Province of Teutonia. In this Province there are 13 Fraternities with about 400 members. There are four Fraternities in Cologne whose members are engaged in the pastoral activities of their parish and are involved in social work with visits to the elderly, the sick and in prisons. There are two Fraternities in Düsseldorf with 26 members who meet weekly for prayers, formation, social exchange and planning. Br David then visited some of the Fraternities within the limits of the Province of France. There are 30 Fraternities in this Province, and four groups are in formation. They are organized in five regions whose presidents together with the Provincial President and the Provincial Religious Assistant form the Provincial Council, which meets four times a year. The Fraternities he visited are those in Lille, Paris, Besançon and Strasbourg. 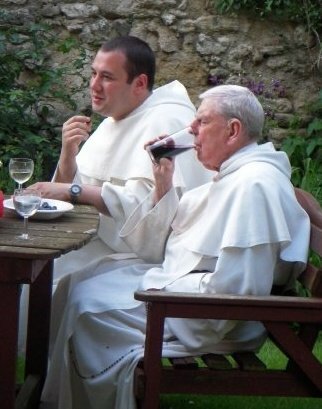 Of your charity, please pray for the repose of the soul of Br Vincent Cook OP (1924-2011) who died at Stone on Saturday. At the February meeting, we looked at the imagery of God and Christ as shepherd, both in the Old and the New Testaments. We also had a report from the Lay Dominican Provincial Council Meeting which was held at St Dominic’s Priory in London on January 22. A Vision of Virtue– Takes place in Hull and will include an applied session on Ethics and Virtue; Can there be an ethical policy on foreign policy? 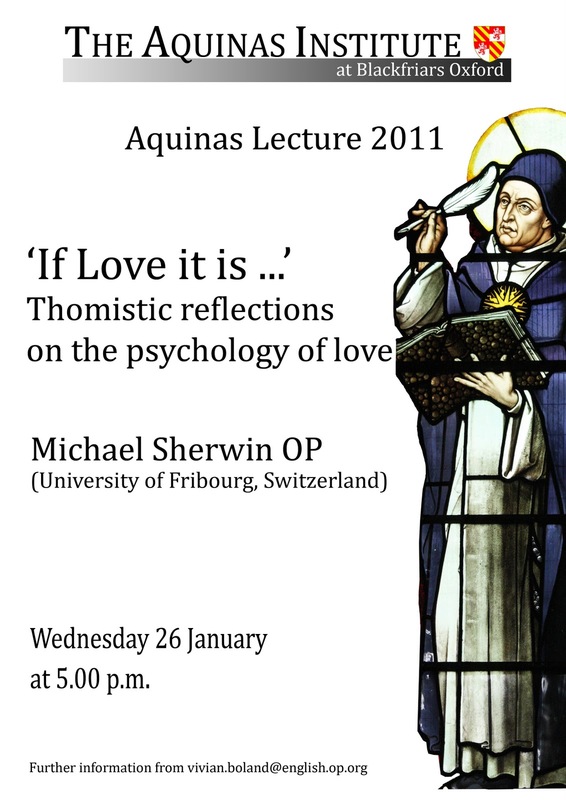 Speakers will hopefully include: Fr Vivian Boland OP – Aquinas – Prudence in Practice and Fr John Farrell OP – The Spirit’s Guidance in Moral Virtue among others. January 6 to 8: The 2012 DOMINICAN SEMINAR will be held at Hinsely Hall in Leeds and is entitled: “Vatican II-50 Years on”. Fr John Farrell OP is organising the speakers who will include friars, sisters and laity. 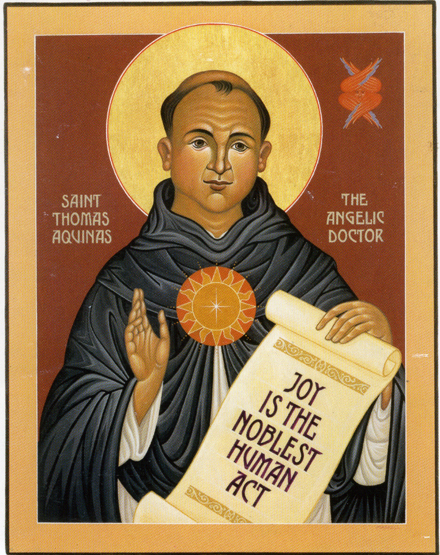 St Thomas Aquinas–known in the Church as the Angelic or the Common Doctor–is one of the Church’s greatest theologians and philosophers. Although Thomas died at the tender age of 49, outlived by his mentor Albert the Great, he left behind him a corpus of theological work which changed the face of the Church forever. Born in 1225 in Aquino, a town in Lazio near the famous Benedictine Abbey of Monte Cassino, St Thomas was destined by his family to become a Benedictine monk, but the scholarly and single-minded young man was determined to join the Dominicans. The Order, founded by St Dominic and approved by Pope Honorius III less than 10 years before Thomas’s birth, marked a radical change from the Church’s monastic tradition with its mendicant preaching friars. Setting himself against his family’s wishes, St Thomas prevailed and joined the Dominican Order where he was sent to the great University of Paris, the centre of learning in the Medieval world. It is here he would have first encountered St Albert the Great. Thanks to Islamic scholarship, the medieval world saw an influx of classical scholars and texts, including the work of Aristotle. Much of St Thomas’s work was involved in tying the Christian tradition to the classical tradition which preceded it and incorporating an Aristotelian world-view into Christian philosophy and theology. For St Thomas, Natural Law was a key point of focus for his academic work. From Paris, St Thomas, who was described by contemporaries as an ox, went to Cologne to teach and back to Paris again. Then, obedient, he went to Orvieto near Naples, before being sent to Rome to set up a Dominican Studium at Santa Sabina. While he was there he started writing his most famous and most important work the Summa Theologica. He was sent back to Paris to be regent of the university at a particularly difficult time in the University’s life, during which the different Aristotelian interpretations were being challenged, disputed and condemned. In 1272 he returned to Italy where he eventually died in 1274. For a really good short introduction to the life of St Thomas Aquinas, Fr Vivian Boland OP has written a biography for the Catholic Truth Society. GK Chesterton also wrote a life of St Thomas. And you can download the Summa for free from Project Gutenberg.